This drill, called a two-on-zero (2-0) interchange pass, helps players develop their neutral zone transitional skills. 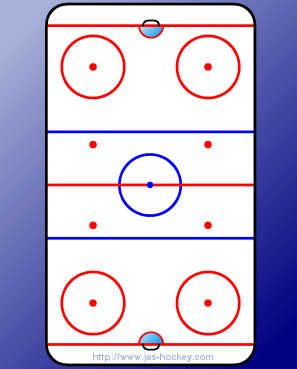 The players line up at both ends of the rink in the corners. 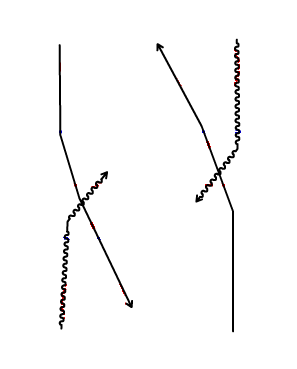 Two players start from each end simultaneously, with one player at each end with a ball/puck. The puck carrier passes to the open man from the opposite end inside the neutral zone (black arrows), then breaks for a pass from his partner. Once receiving the pass, the player goes in and shoots on goal, while the passer breaks in for any rebounds given up by the goalie.